Bahrain’s Asry, the leading ship and rig repair yard in the Arabian Gulf, signed a major services agreement with UK-based Relay Engineering Limited, which requires the latter to offer its expertise in electrical, mechanical and constructive engineering directly to Asry’s customers from a dedicated service point in the yard. The yard also reported that its offshore division which specialises in rig repairs achieved 100 per cent on-time delivery of all the rig projects completed in 2014. 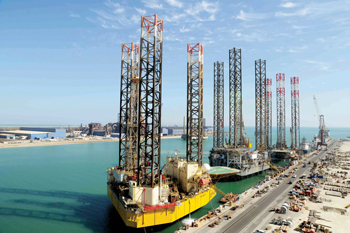 Global clients – some of whom were Saudi Aramco, Saipem, Nabors Drilling and Egyptian Drilling Company – chose Asry for their rig repair projects last year, which totalled 17 rigs, and all took delivery of their vessels on schedule, and within budget. With regards to the agreement signed with Relay Engineering, Asry said it was accomplished under the umbrella of the ongoing Project Jupiter – an initiative to make Bahrain shipyard the leading hub of onsite specialist contractors in the Arabian Gulf. The agreement will see Relay provide a dedicated service point at Asry to offer its specialised electrical and instrumentation works on-board vessels calling at the yard, in particular on navy vessels, jack-up rigs and barges. Relay Engineering managing director Paul Fisher added that this step is a major achievement and with the new arrangement, Asry will now turn to be a hub in the region from which Relay Engineering can offer its wide range of services to all customers visiting Asry. In 2015, this reputation of timely, safe, cost-conscious reliability has attracted other big names to the yard, confirmed Asry offshore service general manager Rob Bryant. “Despite the challenging market, there are some firms who are expanding their offshore activity, such as Shelf Drilling, who are choosing Asry to ensure the new rig assets they are bringing to the region are optimised, certified, and up to Aramco and ABS specifications. They know when they come to Asry, they’ll get a safe, quick, quality turnaround within budget,” he said. The offshore division of Asry has also recently seen its capabilities expand to include onshore industrial work in Saudi Arabia, with involvement in a project in Saudi called Camellia. Asry was commissioned to design procure and fabricate a significant number of stainless steel hoppers, pipe spools, valves, flanges and fittings, for the new Camellia catalysts production facility, which is being built by Axens Catalysts Arabiya, a company specialising in process licensing and manufacture and sales of catalysts and absorbents in the fields of refining, petrochemical, gas and biofuels. 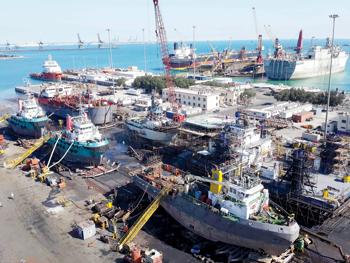 Founded in 1977, Asry is the Arabian Gulf’s most experienced ship and rig repair yard. Its leading range of facilities includes a 500,000 dwt drydock, two floating docks of 252 m and 227 m length, 15 repair berths with a total length of approximately 4,000 m, twin 255 m slipways as well as a full range of workshops and service centres.